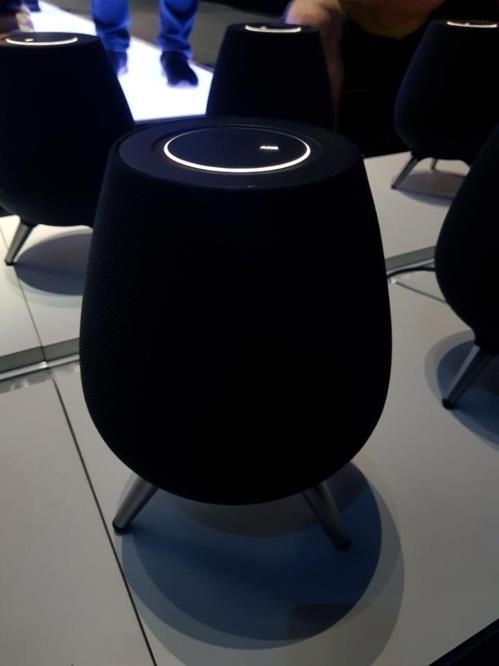 SEOUL, Aug. 10 (Yonhap) -- Samsung Electronics Co. on Friday announced its first artificial-intelligence speaker, the Galaxy Home, in a surprise move during the showcase event of the new Galaxy Note 9 smartphone. It marked the first time for Samsung to unveil the official name of its much-awaited speaker. According to the information provided through the showcase event, the black-colored Galaxy Home has three legs and is equipped with the new version of Samsung's voice-recognition system Bixby. Samsung said the Galaxy Home comes with the surround-sound system, and is capable of recognizing distant voices with its eight microphones. The tech giant said the speaker is an example of how the company is making efforts to expand its intelligent ecosystem. The company did not provided detailed specifications, along with the release date, but claimed it will show more of the speaker in the developer's conference slated for November. Samsung also demonstrated how the Bixby system evolved to handle more complicated tasks. During the showcase event, the voice-recognition system provided information on nearby restaurants and helped making reservations.